Here are some tips for interacting with editors from competing publications at industry events. This past year, I had the opportunity to work on the editorial staff for Lawn & Landscape magazine at GIE Media in the Cleveland area. I recently transitioned to Recycling Today magazine at GIE Media. This is an exciting change for me, but it also made me reflect on some of the things I enjoyed about covering the landscaping industry for a B2B publication. One thing that really impresses me about the landscaping industry is the ability of landscape contractors to collaborate with other contractors. They are willing to work with their competitors in order to advance their industry. During trade shows or conferences, landscape contractors regularly share best practices and success stories with attendees, even though some of the attendees are competitors. Landscape contractors don’t keep many secrets—many of them are open about their revenue, business strategies and hiring strategies. Although their focus is always on growing their own business, they are willing to share tips with competitors to help them succeed and, in turn, help the whole industry to succeed. I think B2B editors could learn from landscape contractors’ example when it comes to interacting with competitors at events. I seldom think of helping competitors when I run into them at trade shows, conferences or networking events. I usually greet competitors if I run into them and maybe ask them how they’re doing, but that’s the extent of the communication I have with them. However, when I consider how landscape contractors act with their competitors, I like that they take things a step further. They are willing to help their competitors, which allows them to improve their industry overall. Although I do think B2B editors should try to build some level of camaraderie with competitors, we should also be cautious to not become too friendly nor erode trust with publishers in this area. In B2B publishing, companies sometimes lose employees to competitors, or sometimes competitors have worked together in the past. With these factors in mind, I think there are a few topics that shouldn’t be brought up when connecting with competitors. First, job advice gossip is a topic that editors should never bring up when connecting with competitors. Gossip in general should be avoided no matter what in any workplace, but this is even more essential to avoid when talking to a competitor. Your competitor doesn’t need to know that “John Smith” just left your company, nor does your competitor need to know the ups and downs at your company. You also shouldn’t brag about any big projects or upcoming cover story details to competitors. While the competitor may be familiar with “John Smith” or your company’s work, it’s not their business to know specific ins and outs of your company. Divulging that kind of information with a competitor is disrespectful to your employer, and it would almost certainly upset the publisher. Second, B2B editors should avoid meeting competitors in private, particularly at industry or networking events. It looks suspicious if two competitor editors meet in private for coffee while a big event is going on. Again, this is disrespectful to both your employer and your publisher. So, try to keep these interactions or meetings in public and in group settings. Third, I think B2B editors need to make sure their publishing company is OK with them connecting with competitors before doing so at industry events. 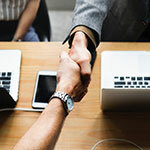 Some B2B companies or publishers don’t get along at all with competitors, so connecting with competitors without the publisher’s approval first could be viewed as a breach of loyalty. Although giving a presentation on the best apps for journalists might be innocent and even helpful to advancing the publishing industry, editors should refrain from doing so unless a publisher approves it. So, in any instance, make sure your company and publisher are OK with you connecting with a competitor at an industry or networking event, even if it’s a presentation for other journalists at an association event. Share tips: Press conferences go fast, and sometimes we miss some of the facts or names mentioned by the speaker. So, if a competitor editor asks you what the spelling is for the full name of the speaker, be willing to give them the tip. It won’t change the final article either editor ends up writing, and it shows your willingness to collaborate. Also, if you end up in the same position at a future press conference, that editor will be more willing to reciprocate. Offer technical advice: There are various networking events for journalists across the U.S. where editors and reporters alike discuss best practices for social media, digital tools and ethics. Although competitors might be in attendance, sharing this type of education with one another is helpful in that it allows everyone to learn from one another. Although you might be sharing some useful tools or technical skills you learned over the years, you will probably also benefit from learning what others are doing, as well. It’s a win-win situation. Lend a hand: It’s not uncommon to forget to pack the small things like phone chargers, notebooks or pens while traveling to cover industry events. So, if an editor in a press room forgot to bring a phone charger, offer to lend them yours for a minute. Again, if you end up in this same position at a future event, others will be more willing to lend to you as well. Get to know them: When attending industry events like trade shows, it can be overwhelming to be in a sea of unfamiliar faces. So, it’s nice to have familiar faces like editors on competitor magazines to connect with at these events. Share stories with one another on what got you into B2B publishing. Talk about general interests. Share lessons learned from work over the years. It will make the entire event more enjoyable. Encourage them: Sometimes simple encouragement can go a long way. If you noticed that a competitor featured a great cover story recently, it wouldn’t be a bad idea to encourage them by letting them know they did a great job. This will make the competitor feel good, and it will also show them that you’re a good sport. Surprise them: While attending an industry event in August, I was thoroughly surprised when an editor on another publication bought me coffee while I was trying to wrap up work in a hotel lobby. The editor didn’t need to go out of his way to surprise me that way—we didn’t even work together—but I was extremely grateful and appreciative at his thoughtfulness. It reminded me of the importance of giving back to others. So, the next time you are at an industry event and notice a frazzled editor trying to meet deadline in a hotel lobby or press room, surprise them with coffee or water. Do you have any tips or advice for connecting and networking with competitors? Or, what are topics you think need to be avoided with competitors at all costs? Share your thoughts in the comments below.